The dabbling duck that is by far the most regular on the island group. Usually recorded on west Spitsbergen and on Bjørnøya. Occurs singly or in small flocks of up to twenty, usually with a clear preponderance of males. In autumn the species is scarce and irregular. Features: 34-38 cm, ca. 350 gram. The smallest duck species on Svalbard. Rises quickly and steeply, often with sudden turns in flight. 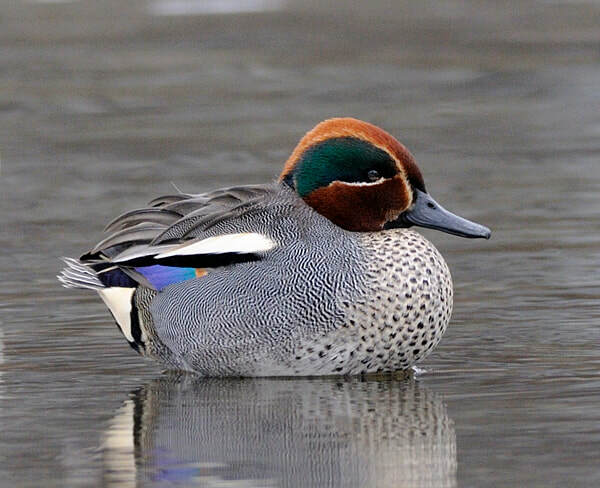 Females, juveniles and males in late summer plumage are speckled brown and can then be easily confused with closely related species (Green-winged Teal, Garganey, Baikal Teal and Blue-winged Teal) all of which are very rare visitors to the island group. Calling is common in spring by both sexes, most often by the male which has a characteristic clear whistle «krrrriik». ​Breeding: Probably makes annual breeding attempts by nutritious fresh water in the fertile valleys of west Spitsbergen. 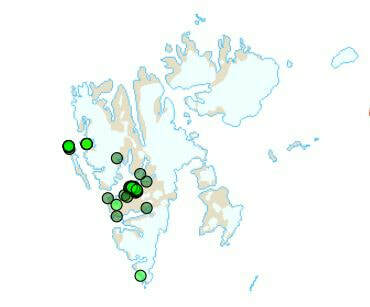 Has been proved to breed some few times in Adventdalen by Longyearbyen, and once in Ny-Ålesund.